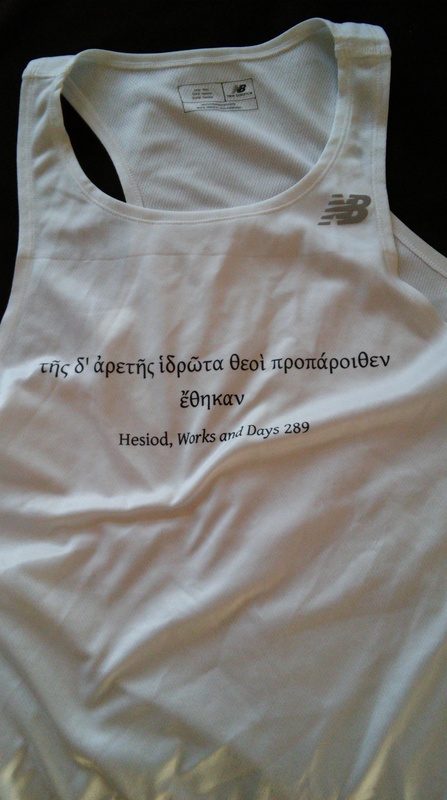 Sentantiae Antiquae is running a Marathon today (For real, Rock N’ Roll San Antonio). Here’s a quote for every mile. “Amidst hope and anxiety, fear and rage, believe that every day has risen as your last: pleasant is the arrival of the hour which was never expected”. ἀλλὰ καὶ τὴν φιλοτιμίαν ἐκδηλοτέραν ἐποίει, πρὸς μηδένα πόνον μηδὲ πρᾶξιν ἀπαγορεύοντος αὐτοῦ διὰ τὴν χωλότητα. Ex illo quo primum lucem uidit iter mortis ingressus est…. “There is a certain pleasantness to crying — pain is brought up and expelled through tears”.
. . . est quaedam flere voluptas expletur lacrimis egeriturque dolor. τῷ δὲ θεοὶ νεμεσῶσι καὶ ἀνέρες ὅς κεν ἀεργὸς. ἢ ὅ τι ποσσίν τε ῥέξῃ καὶ χερσὶν ἑῇσιν. …πάντων δὲ παλίντροπός ἐστι κέλευθος. “Sport tends to give rise to heated strife and anger, anger in turns brings savage feuds and war to the death”. ludus enim genuit trepidum certamen et iram, ira truces inimicitias et funebre bellum. …nec taedia coepti ulla mei capiam, dum spiritus iste manebit. nam primum, si facta mihi revocare liceret, non coepisse fuit; coepta expugnare secundum est. θαρσεῖν χρὴ φίλε Βάττε: τάχ᾽ αὔριον ἔσσετ᾽ ἄμεινον. ἐλπίδες ἐν ζωοῖσιν, ἀνέλπιστοι δὲ θανόντες. χὡ Ζεὺς ἄλλοκα μὲν πέλει αἴθριος, ἄλλοκα δ᾽ ὕει. To quote a previous post.